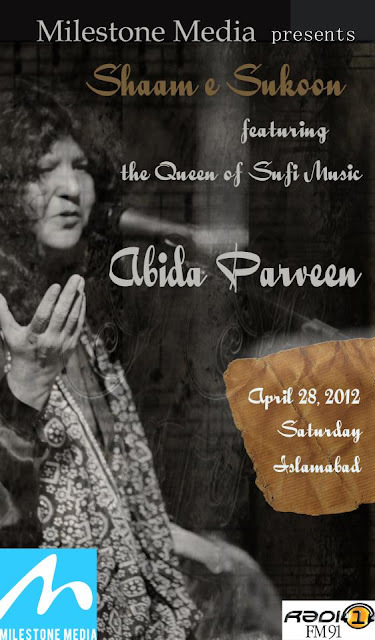 Milestone Media presents "Shaam-e-Sukoon" feaeturing the Queen of Sufi Music Abida Parveen -- Live in Islamabad. Shaam-e-Sukoon, the pioneer Brand in the Entertainment Industry of Pakistan to provide exclusive enjoyment and pleasure by live performances of Legend Music Icons and Music Ensembles. It brings you an event that would take you into a world of peace and tranquility, a night filled with beautiful and serene echoes of the harmony that would touch nothing else but your soul. A legend both at home and abroad for her grace and soulful Sufi strains, Abida Parveen over the years has stayed true to her classical origins, which she mastered. A recipient of the 1982 President's Pride of Performance Award and 2005 Sitara-e-Imtiaz, Parveen is indeed one of the foremost exponents of kaafi poetry and ghazal singing in pakista. "Come Refresh Your Soul & Speak to Yourself"
Account Title, Account Number, Bank Address will be provided upon booking.